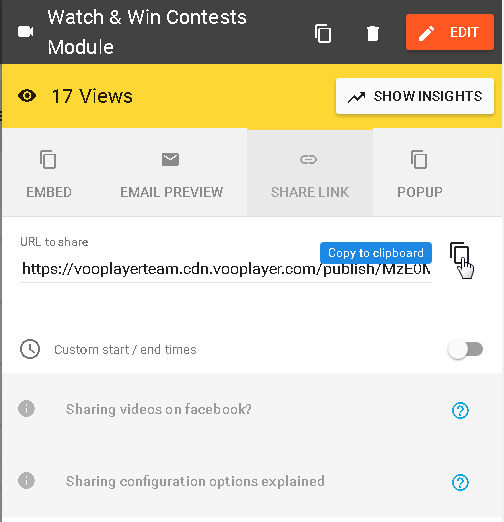 To share a link of your video, just select the desired one, click on it, and go to the SHARE LINK tab. There is the "Copy to clipboard" button, so you can copy the link and paste it anywhere. All viewers will be redirected to your Watch Page, so they can view the video without any issues. 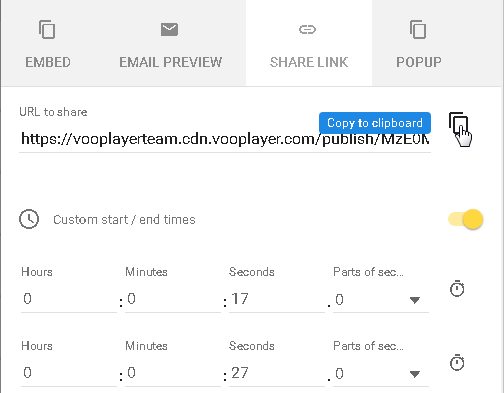 The option "Custom start / end times" allows you to share a specific segment of your video, for example some interesting part which happened between 17th and 27th second. The viewer will be able to see only that part of your video, he will not be able to rewind the video to the beginning or skip to the end. This option is very useful when you are sharing videos made by someone else and you wish to hide some content. Just toggle the slider to the position right, set desired timings and the URL for sharing will be updated automatically. If you wish to share your videos this way, your Watch Page (Video Page Customization) must be enabled. By default it is enabled, just do not forget to remove a check mark from the corresponding box if you have previously disabled it .